“September and October of 2008 was the worst financial crisis in global history, including the Great Depression,” former chairman of the U.S. Federal Reserve Ben Bernanke has observed. The bottom fell out of the economies in many nations, ushering in widespread malaise. A decade later, economies have gradually recovered and the public mood has rebounded, especially in some of the hardest-hit advanced economies, according to a spring 2018 Pew Research Center survey of 27 countries around the globe. The change in the public’s economic mood has been dramatic in some nations. In 2018, nearly eight-in-ten Germans (78%) say economic conditions in their country are good, up 50 percentage points from 2009. Nearly two-thirds of Americans (65%) are similarly upbeat about their economy, with their assessment up 48 points. And the economic mood has improved 40 points in Poland, 35 points in the United Kingdom, 34 points in Japan and 24 points in Kenya since the depth of the Great Recession. More positive public feelings about the current economy have not erased concern about the future, however. In 18 of the 27 nations surveyed, including 80% of the French, 76% of the Japanese and 72% of the Spanish, half or more of the public believes that when children today in their country grow up they will be worse off financially than their parents. In previous Pew Research Center surveys, such worries were largely confined to advanced economies, but now people in emerging markets increasingly express concerns about the financial well-being of the next generation. Economic nostalgia is also widespread. In roughly half the countries surveyed, a plurality to majority of the public says the financial situation of average people today is worse, compared with the pre-crisis era 20 years ago. This includes 87% of Greeks, 75% of Tunisians and 72% of Italians. These are among the major findings from a Pew Research Center survey conducted among 30,133 respondents in 27 countries from May 14 to Aug. 12, 2018. The nations included in the survey account for roughly two-thirds of the global gross domestic product. The current uptick in positive economic sentiment has been striking in Europe, Japan and the United States. In the wake of the financial crisis a decade ago, the U.S. economy shrunk by 2.8%, the EU economy by 4.2% and the Japanese economy by 5.4%. Not surprisingly, public assessment of these economies also dropped. But as economic growth has rebounded, so too has public sentiment. 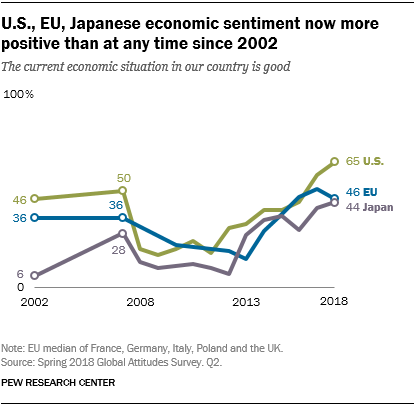 Today, American, European and Japanese adults have a more positive view of their own country’s economic situation than they have had at any time since 2002. In most of the nations surveyed, economic confidence plateaued over the past year, with public optimism similarly pronounced in 2017 and 2018. Some exceptions between 2017 and 2018 include significant upward swings in economic confidence in France (up 22 points) and South Korea (up 16 points), as well as a steep downward turn in India (down 27 points). In the latter case, despite this decline, more than half of the public still voices a positive assessment of their economy. Despite the dramatic improvement in the public’s view of national economic conditions, in many societies people are not that hopeful about what lies ahead for the next generation. In advanced economies surveyed, a median of just 34% believe that when children today in their country grow up they will be better off financially than their parents. Among the emerging markets polled, slightly more (42%) anticipate a brighter economic future for today’s children, but, still far from a majority hold this view. Pessimism about the future is especially striking in some countries where current conditions are rated positively, as doubts remain about the next generation’s financial well-being. Among advanced economies surveyed, only in Poland does a majority rate both the current economy (69%) and the economic future of today’s children (59%) positively. But even there, optimism declines from present to future. In 13 advanced economies, publics are more likely to say that their country’s current economic situation is good than to voice the view that today’s children will be better off financially than their parents. This experience-expectation differential is greatest in the Netherlands, Sweden and Germany where roughly eight-in-ten adults or more say their economy is doing well, but less than four-in-ten believe the next generation’s prosperity will exceed that of their parents. Among the emerging markets surveyed, only in the Philippines, Indonesia and India do majorities speak positively about both their current economy and anticipate that today’s children will be better off than their parents. In a number of emerging markets, people are more optimistic about the future compared with current economic conditions, but overall levels of confidence about their children’s financial well-being are not especially high. Since 2013, the share of the public expecting children’s future financial situation to be worse than that of their parents has risen fairly sharply in some emerging economies, up 35 points in Brazil, 28 points in Kenya and 25 points in Tunisia since 2013. Trend data comparing current economic perspectives with long-term expectations exist for the United States and paint a fairly gloomy picture. The share of U.S. children who grow up to have higher inflation-adjusted incomes than their parents has declined steadily from around 90% for children born in 1940 to 50% for those born in 1984, according to a recent Brookings Institution study. Mirroring these income trends, most Americans expect worse times for the coming generation. For example, today, 65% of adults say the current economic situation is good. But only 33% believe that today’s children in the U.S. will be better off financially than their parents. Such pessimism is largely unchanged since 2013. These views have not improved in light of the U.S. economy’s strong economic performance of late. And the gap between satisfaction with the current economy and hope for the finances of the next generation has widened. Along with failure to erase doubts about the future, economic confidence today is dogged by the popular belief that times were better before the Great Recession. Substantial shares in 15 of the 27 nations polled believe that, compared with 20 years ago, the financial situation of average people in their country is worse today. This view is especially pronounced in Greece (87%), Tunisia (75%), Italy (72%), Spain (62%), France (56%) and the UK (53%). But public perceptions of a more prosperous past often do not mirror real economic change. In Brazil, where a plurality of 43% say personal financial conditions are worse today than 20 years ago, adjusted per capita gross domestic product (GDP) calculated on a purchasing power parity (PPP) basis is actually up 26% since 1998. In Mexico, while 40% say times are worse for average people, per capita GDP is 16% higher. The same is the case in Spain and France, where a majority of the public believes personal finances have deteriorated, but per capita real GDP has improved 25% and 11% respectively. How one feels about the past may also reflect how one feels about the present. In 26 of the 27 nations surveyed, those who say current economic conditions are bad are also likely to believe that the financial situation of the average person in their country is worse today than it was 20 years ago. In a number of European countries, people sympathetic to populist parties are often more negative about current economic conditions. In Sweden, for instance, those who have a favorable view of the Sweden Democrats are less likely to have a positive view of economic conditions than are those who have an unfavorable view of the anti-immigrant party. In France, about a quarter of supporters of the National Front think the French economy is good, while just under half of other French adults are positive about the economy. There is also a difference between how backers of the AfD in Germany and other Germans see their economy. And in Spain, supporters of the left-wing populist party Podemos assess economic conditions less favorably than the rest of the Spanish public.